Life expectancy in advanced pancreatic cancers is only about nine to ten months with the current treatments including Chemotherapy. Herein we report a 26 month survival of a pancreatic cancer patient treated with Autologous Immune Enhancement Therapy (AIET) and chemotherapy. A 40 year old male patient with no family history of cancer presented with symptoms of Obstructive jaundice, loss of weight and appetite, pale stools and new onset Diabetes Mellitus in January 2007. Examination showed a palpable gallbladder without lymphadenopathy. The Haemoglobin level was 10.5 g/dl; Tumour marker CA-125 was 4.0 U/ml and CA 19-9 was 3900 U/ml. Further investigations revealed Carcinoma of the pancreatic head involving uncinate process with the tumour measuring 4.2 × 3.2 cm and the Common Bile Duct (CBD) measuring 1.9 cm without involvement of the Superior mesenteric vein. Endoscopic retrograde cholangiopancreatography showed it to be a moderately differentiated Grade III Adenocarcinoma. CBD stenting was done in February 2007. Palliative surgery of Cholecystectomy, hepatico-jejunostomy using Roux-n-Y loop of jejunum, Gastrojejunostomy and jejuno-jejunostomy were done. Subsequently, he was administered six cycles of adjuvant chemotherapy (Gemcitabine, Leucovorin and 5-FU) and three cycles of AIET, as AIET has a proven record of safety for more than two decades with randomised clinical trials establishing its efficacy. After informed consent, 60 mL of Peripheral Blood (PB) was collected for each cycle of AIET. The Natural Killer (NK) Cells and Cytotoxic T lymphocytes were isolated and expanded following GMP compliant protocols using the patients' autologous plasma as earlier reported , without using any feeder layers or animal products or allogeneic serum. 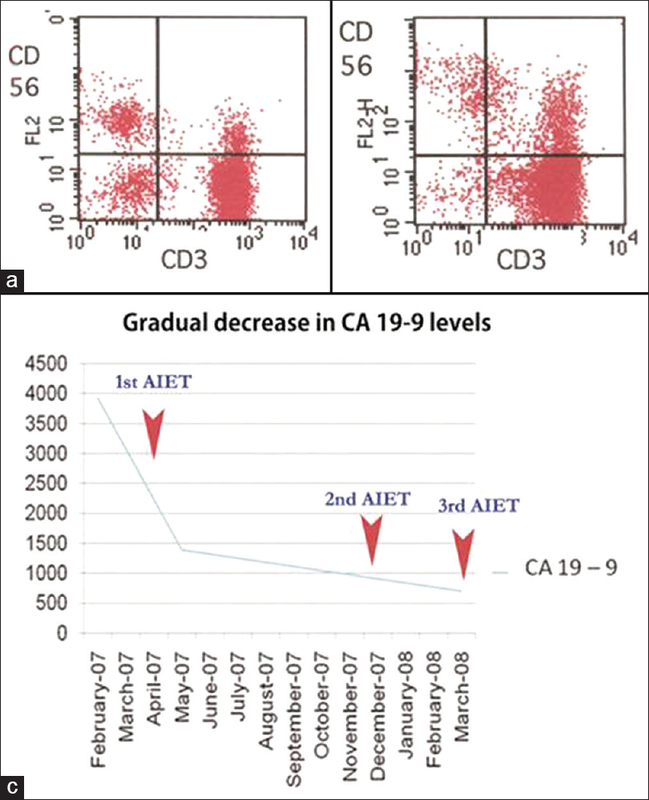 The cells multiplied were subjected to flow cytometry for CD3, CD56, CD16, CD34, CD45 and HLADR markers which showed an increased activation of expanded lymphocytes [Figure 1]a, [Figure 1]b. Activated and expanded cells were infused intravenously. The first AIET infusion was given between the second and third chemotherapy cycles in April 2007 and the second infusion after the completion of six cycles of chemotherapy in December 2007. The tumour marker CA 19-9 decreased to 1000 U/ml. Surgical removal of the tumour was attempted after the second AIET but in vain. In March 2008, the third AIET was administered. The average count of lymphocytes infused was 61.3 millions. The CA 19-9 decreased further to 600 U/ml after the third AIET [Figure 1]c. The patient had subjective improvements in appetite and quality of life. He survived for 26 months after the initial diagnosis while the expected survival in these patients as per reported literatures is less than 10 months. This is in line or even longer than that reported by Kaneko et al. in which the survival time of immunotherapy combined with chemotherapy was 15.8 months in 28 patients with advanced pancreatic cancers. The patient did not have any kind of adverse reactions after the AIET transfusions. With our experience in this case, where AIET given in combination with chemotherapy has resulted in prolonged survival of 26 months in an inoperable advanced pancreatic carcinoma patient, we recommend that this option be considered for similar cases. M/S Hope Foundation (Trust), Chennai, India for funding the study. Dr. Preethy Senthilkumar for her assistance in drafting the manuscript. Takayama T, Sekine T, Makuuchi M, Yamasaki S, Kosuge T, Yamamoto J, et al. Adoptive immunotherapy to lower postsurgical recurrence rates of hepatocellular carcinoma: A randomised trial. Lancet 2000;356:802-7. Takada M, Terunuma H, Deng X, Dewan MZ, Saji S, Kuroi K, et al. Refractory lung metastasis from breast cancer treated with multidisciplinary therapy including an immunological approach, Breast Cancer 2011;18:64-7. Dedeepiya V, Terunuma H, Deng X, Baskar S, Manjunath S, Senthilkumar R, et al. A comparative analysis of in vitro expansion of natural killer cells of a patient with autoimmune haemolytic anaemia and ovarian cancer with patients with other solid tumours. Oncology Lett 2011;3:435-40. Kaneko T, Goto S, Kato A, Akeyama A, Tomonaga M, Fujimoto K, et al. Efficacy of immuno-cell therapy in patients with advanced pancreatic cancer. Anticancer Res 2005;25:3709-14.